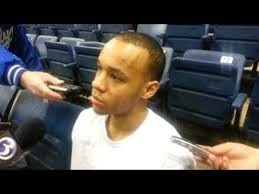 Bluegrass Pundit: Stupid: Starving UConn basketball guard Shabazz Napier has access to unlimited food. Stupid: Starving UConn basketball guard Shabazz Napier has access to unlimited food. “We are definitely best to get a scholarship to our universities, but at the end of the day, that doesn’t cover everything. We do have hungry nights that we don’t have enough money to get food and sometimes money is needed,” Napier told Fox Sports while discussing the National Labor Relations Board ruling that athletes from Northwestern can unionize. According to the UConn Student-Athlete Handbook, unlimited access to dining halls is available for students with a meal plan, even for those who live-off campus. Dennis Pierce, director of Food Services at UConn, tells CNSNews.com that any student-athlete would have the option of choosing from a series of dining services (unlimited, value and custom), but all offer unlimited access during operating hours.